I experienced many of the Eight Wastes including delay, defects, over-processing, and inventory in my fellow prospective jurors! I spent much of the time is a thick fog and felt anxiety and frustration. Chats with friends & colleagues suggest my experience was not unusual. Yet, our trial by jury process is precious & we need to support it. So, how might we improve? We might start by doing a SIPOC analysis: Supplier - Inputs - Process - Outputs - Customer. Here's how our SIPOC might unfold. Let's start, as ever, with the customer. Who is the customer? Why, the public. ◦ How many jury panel members and jurors do we need? ◦ When, and for how long, do we need them? ◦ How many do we currently have? Is this above or below our standard? ◦ What do we need to do get back to standard? Without this info, we're likely to call too many jury panel members, for too many days, thereby generating delay, over-processing, defects & other forms of waste. So, information flow seems an important direct cause. Use information technology better so al to provide jury panel members with answers to questions posed above. 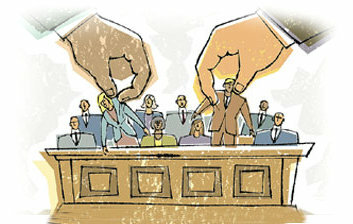 ◦ For example, can we not communicate with jury panel members by cell phone and e-mail? "We won't need you tomorrow..."
Again, I don't want to be misunderstood. The problem, is in the jury selection process, not the people, who I found to be courteous, competent and cheerful.